I talk with Mike Williams on his Sydney 2UE radio programme on a semi regular basis. He has an open mind on the subject and supports the approach I have in examining the UFO subject from an objective scientific point of view. Tonight (Sunday 28 January 2007) we talked about a subject close to my heart, namely the phenomenon of intense localised UFO flaps. It is the sense of the classic mainstay of the scientific method, namely the repeatable experiment, that attracted me to try to confront the reality behind UFO flaps. Here was the opportunity for researchers to witness UFO phenomena directly rather than just replying on UFO witness testimony. For me the opportunity to interact with the UFO phenomenon in the form of an unfolding intense localised UFO flap came in 1973 while I was attending the University of New England at Armidale New South Wales (NSW) doing a science degree majoring in chemistry and mathematics. I developed an informal network and we soon started getting reports passed through to us. I was by then "UFO central" on the university campus for UFO reports. Reports came in from the north coast and New England regions of NSW. So when I learnt of the "Skinwalker" ranch saga being played out in Utah and the elusive but confronting phenomena being encountered there, I certainly experienced a strong sense of deja vu. 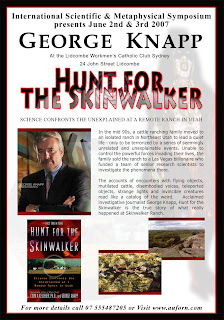 The key scientist involved in the attempt to scientifically examined the Utah ranch events Dr. Colm Kelleher teamed up with Las Vegas journalist George Knapp to write the book "Hunt for the Skinwalker". Even though I would have preferred to read more of the science involved the book provides a provocative insight into intense UFO flap activity. George Knapp will be lecturing in Sydney at the 2nd International Scientific & Metaphysical Symposium on June 2-3 2007 at the Lidcombe Workmens Catholic Club. I have been assisting a witness to a fascinating UFO event seen from the Milperra area of Sydney over the Bankstown area to try to track down the date of his UFO event. He thinks it might have occurred in either 1969 or 1970. My UFOIC blog site (see links opposite) describes part of the 1969 "UFO nest" saga in northern NSW. The witness spoke on Graeme Gilbert's radio 2 SM Talk Show on Wednesday night January 17, 2007. 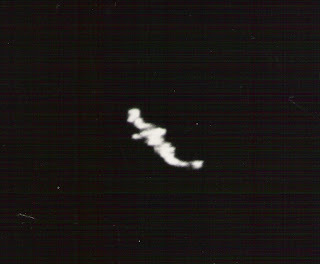 That appearance attracted some callers that might have contributed an accurate date in April 1970. This has yet to be confirmed. Another caller recollected the newspaper report that featured a photograph of the alleged UFO landing site - with 3 anticlockwise grass circles about three and half paces across. Also fascinating was a caller named Fred who described a striking daylight sighting from Swansea NSW from 1944! It is fascinating to see the power of radio in action helping contribute some possibly helpful information about UFO sightings from the recent and distant past. I have started a new blog site devoted to the Sydney Australia based UFO group UFOIC - the UFO Investigation Centre. It will be used to describe the history, research and investigation activities of the group.